The Softest Girl in All The World. 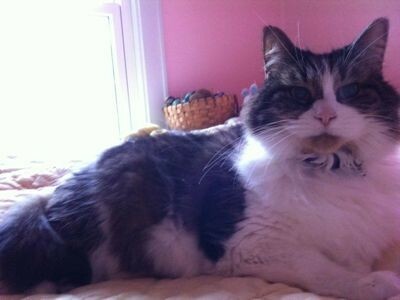 I woke up this morning to some bad news - my mother's cat, Whispa, passed away last night. She had been sick for awhile but my mother only realized it this last week and over the weekend the doctor said she was improving quite a bit. But she went last night. Even the vet was surprised by this. She was my cat originally, from the same litter as Buddy and Roo. When I moved out of Mom's house, she asked if she could keep Whispa and she has had her now for almost ten years. It was strange, how when all the sibling-cats lived together, the boys never cared much for each other. Roo and Buddy still don't pay each other much mind. But they all loved Whispa'. She was the princess. She'd spend her days flitting from one boy to the next like a little mother hen. You never knew who you were going to find snuggling with her and sometimes the boys would get jealous of whoever was sleeping with her, because they wanted to have a turn, but they didn't want to share space with their brothers. She was The Sister and they loved her. Since Mom has had her, Whispa slept every night in bed with her. She will be missed. Whispa', our fluffy soft princess. It's been a hell of a year for my family and their pets. Please give your fluffy, furry babies a kiss for me. Thank you, dear. My mom is naturally quite sad, but so am I.
Dear Whispa. She was certainly loved. I'm kissing my Pip-pup right now, and appreciate her every day of her life. Whispa was a spoiled princess baby and she was loved every day of her life. <3 Pup-kisses are the best. Thank you. I am sad to think Whispa is no longer going to be there, waiting to reach out a paw every time she sees me. I'm so sorry. This makes me doubly glad, though, that your mom's dog came through the attack all right! Thanks, babe. I totally thought that as well, that I can't imagine if Mom had lost Winston earlier this year, only to lose Whispa now. Hopefully Winston has several more years ahead of him now. I'm so very sorry to hear about Wispa. Big hugs.Leo on my lap sends purrs. So sorry to hear about Whispa's passing. Animals are such a part of our lives and it's just wrenching to lose them. We lost our wonderful big gray cat Cuddles three years ago. He was 17 1/2 so he'd lived a good life, especially considering he spent a lot of time outdoors where we have coyotes that prey on cats. He outsmarted them all for a good long time. Thank you. Whispa was such a great cat, she owned every room she walked into. 15 years is a long time for her to have lived and they were good years. I just wish my mom had had some warning time - the quickness of it all has caused her to be quite upset. Thank you, babe. It has been a hard year for my family and their pets. From Winston getting mauled, my dad's dog dying, my cousin's dog that he had since junior high dying, my other cousin's dog slipping a disk and being temporarily paralyzed from the waist down, to Buddy winding down now to not much time left at all and now Whispa passing - it has been a hell of a year. I was hoping with Whispa, Buddy and Roo all being 15 now, that they would space themselves out a bit, hopefully not all go at close times at least. Perhaps Buddy will hang in there and give us some time in between. It does make me wonder though about their brother-cat and whether he is still alive. Awww, baby. My condolences to your mom for losing her best friend. I gave Butternut and Sable pets in remembrance.